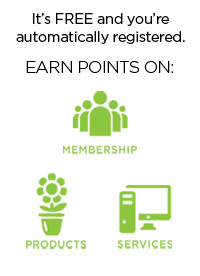 Membership that rewards you by saving money on flowers. FTD is always looking for ways to increase the value of your membership. We designed the FTD Rewards program to help you save money on your number one cost of goods - flowers! There are no program fees and all FTD Member Florists are automatically registered. Each month you will earn one point for every dollar spent on purchases made through FTD, including membership, products and services. You will also earn three points for every dollar spent online at the FTD Flower Exchange. Accrued points are awarded the second business day of the following month and can then be redeemed toward the cost of flowers purchased online through the FTD Flower Exchange. Additional details can be found in the Frequently Asked Questions. If you have any questions, please contact our Member Services team at 800.788.9000.